I’ve gotten sucked back in to Team Fortress 2 (TF2) lately and taking notes of the changes that have happened since I last played. In the course of poking around the Mann Co Shop I’ve been reminded that they have some pretty smart cookies over there at Valve and I for one welcome our new cookie overlords. Specifically, I’ve noticed two things in the store that capitalize on concepts I’ve written about here before. For those of you who don’t remember, Team Fortress 2 is a class-based shooter that has gone free-to-play and supports itself through purchases in the Mann Co Store. You can buy different weapons and cosmetic items there, for prices ranging from just a few cents to …well, I’ll get to that in a second. The first thing I noticed is that the store is now making an interesting use out of something called “the endowment effect.” I’ve written about it before, and the quick version is that once we feel we own something, we value it more. The classic experimental example was when researcher Richard Thaler gave subjects a coffee cup, then shortly afterwords asked how much they would be willing to sell it for. Relative to those who were not given a cup but instead asked how much they would pay for it to own it, those who already owned it placed a higher dollar value on the thing. Now it's YOUR Backburner. Is it worth two bits to you NOW? TF2 gets you to endow certain items from its store by letting you try them out, in game, for free. After seven days, the item goes away, but you’re given a chance to buy it. According to the endowment effect, people might value their new Backburner (level 10 flame thrower) more than they did before, and be willing to pay more for it. But Valve is nice enough and/or smart enough to know that they could probably really drive the bargain home by giving you a 25% discount on the newly tested item. So double whammy. You’re likely to value the item more, plus you don’t want to lose your chance at a discount. Unfortunately Valve seems to only be doing this test drive system for items that are already pretty cheap –in the 50-cent range. I think they could get more use out of it if they let you try it with a few more expensive items. 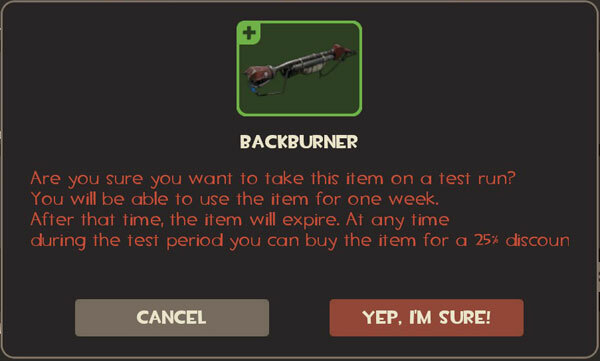 Maybe even put some kind of one-per-week limit on it to prevent doing too crazy, or reduce the test drive period for newer items.1 They could even capitalize on envious reactions from other players who see you using the new item. Yeah, you’re reading that right. 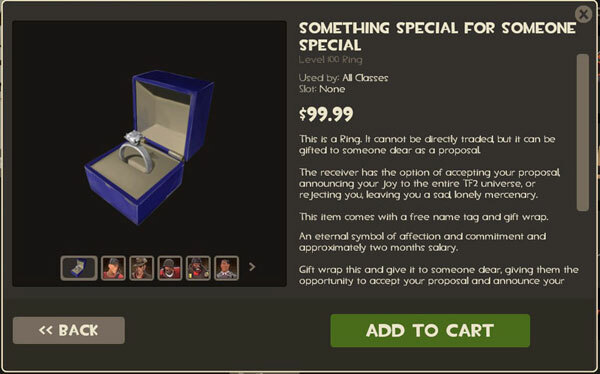 You can now buy a virtual diamond ring in Team Fortress 2 that you can rename and then gift to another player. For $100. ONE. HUNDRED. REAL. DOLLARS. This boggled my mind when I first saw it, but then I realized that they besides cashing in on a few big spenders, the developers may be aiming to capitalize on an age-old sales trick: the contrast effect. Again, this was one of the first topics I wrote about for this blog, but the quickie version is that our perceptions of price (or more to the point, value) can be changed if we see a super high price2 off the bat. Retail sales people use this trick all the time by showing you a more expensive suit first, which makes the cheaper items two racks over seem a lot more affordable, let alone accessories like socks or belts. Ever poked your nose into an upscale clothing store and seen some absurd, $2,000 handbag on display up front? Who would pay that? Well, that’s not the point. The point is that it’s there to make the $200 handbags on the table next to it seem a heck of a lot more affordable –more so than if the super expensive item weren’t there. This is what I think Valve is doing with the diamond ring item. 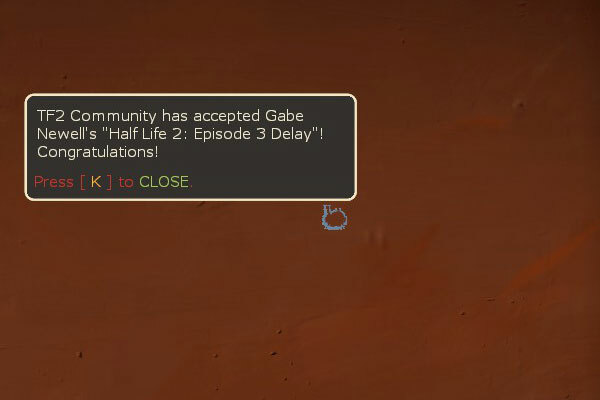 Sure, letting you rename the item, give it to someone, and then broadcast that transaction to the entire Team Fortress 2 community –the whole community that’s online at the time, not just people on your server– will lead some people with more money than sense to have some fun like in the screenshot above. 3 But I think the real benefit is that next to a $100 ring, that $13 hat for your Demoman looks a lot more affordable. 1. Or you know what? I’ve got pallates full of these ManCo Supply Crates that I’m never going to use because I’m not gonna pay $2 to play a TF2 lottery. I’d trade them for a test run of a new item. 2. Or a very cheap price, for that matter. 3. That’s a real screenshot I captured myself during a match, by the way. Y U NO POST ON GOOGLE+ NO MOAR??!? Also I’d like to see them allow developers to be more open about their sales! Hey Jamie, just wanted to thank you for a great blog. Many lessons I’ve learned, and I hope you keep up great work so I can keep on learning. Thanks, Tj’ièn.